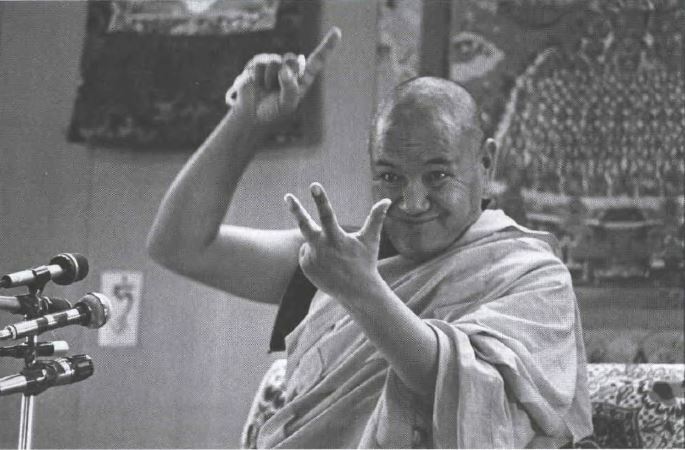 Lama Yeshe: “You’re a fish swimming through water.” Photo by Carol Royce-Wilder. People scare themselves with thoughts of ghosts and demons. It is all superstition, the wrong conception believing in a self-entity There’s no such thing. But when you have a superstitious belief, for some reason it manifests. So you say, “It’s real. I saw it.” What you you saw is important? That’s completely ridiculous. What you see is absolutely unimportant. You need to know that. People in the West set incredible store by what they see; they really do believe that seeing is believing, that what they see is real. This basic misconception also engenders a kind of pride: “I saw that he is this, therefore, he is this.” “I saw” makes your ego proud. This is a completely wrong conception.